Today, Alvin divers Stefan Sievert, Camila Negrão Signori, and pilot Phil Forte recovered three bacterial colonizers that were placed at the deep-sea vents a few days ago. In that short time, tremendous numbers of vent bacteria make themselves at home on the colonizers. 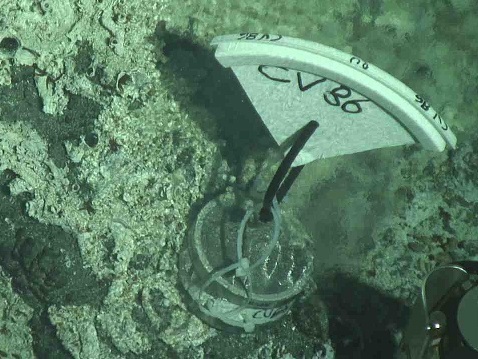 Worms also anchor themselves to the colonizers and start building tubes that host additional bacteria. 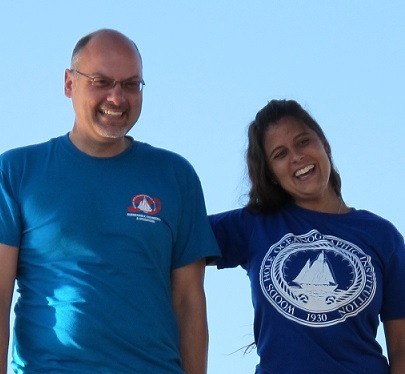 Once the colonizers were back aboard, postdoc Donato Giovannelli (of Costa Vetriani’s lab at Rutgers) scraped off the bacterial biofilms and preserved them. 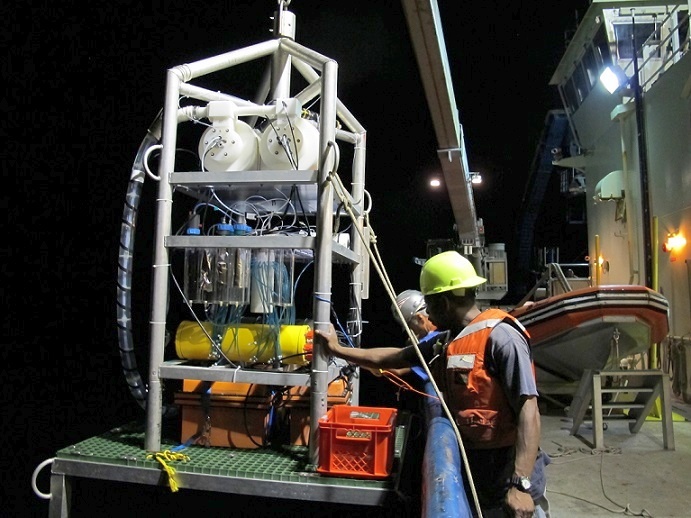 Analysis of their RNA back on shore will help Donato and his colleagues figure out how the biofilm microbes make their living at the vents, as the researchers identify the genes and metabolic pathways the bacteria use to “breathe” and make food from vent fluids. 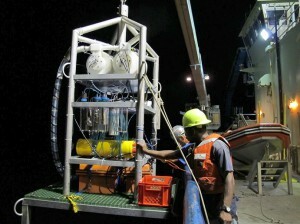 OS Clindor Cacho (front) and bosun Patrick Hennessy put the Vent-SID over the side for testing. Improvements continued on the Vent-SID microbial incubator, which received some software fixes and a fresh bank of batteries today. The platform went into the water for a two-hour test-run near the surface this evening as part of the prep for its next deployment on the bottom. 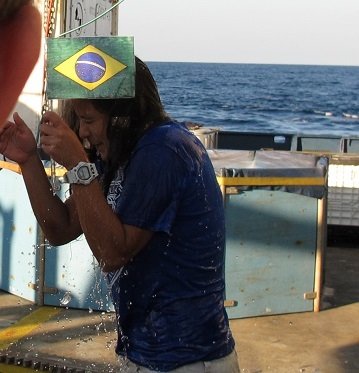 The ice-bucket brigade was hard at work again today for first-time diver Camila. 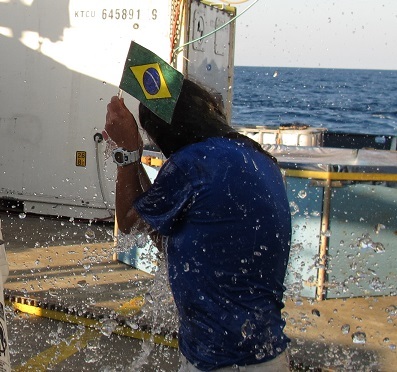 We’re still in the process of checking the official records back at WHOI to confirm this, but Camila may be the first person from Brazil ever to dive in Alvin. 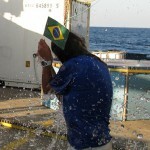 To commemorate this (possible) milestone, she was handed a Brazilian flag before her ice-water initiation.